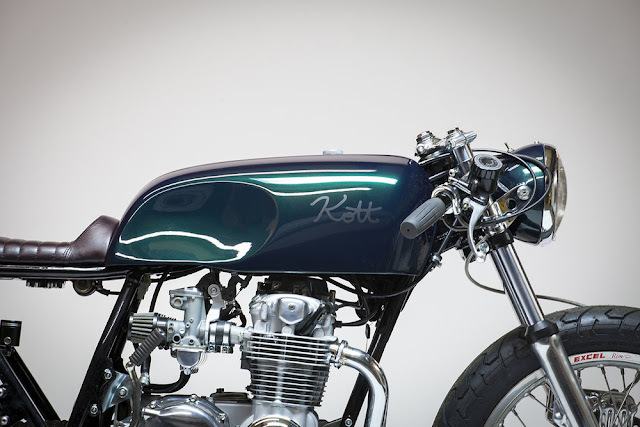 "Through the years of building at Kott Motorcycles, there are certain design queues that repeat themselves. Even though a policy of non repetition of past builds is in place, certain "models" have emerged as a result of time tested proportional ideas. 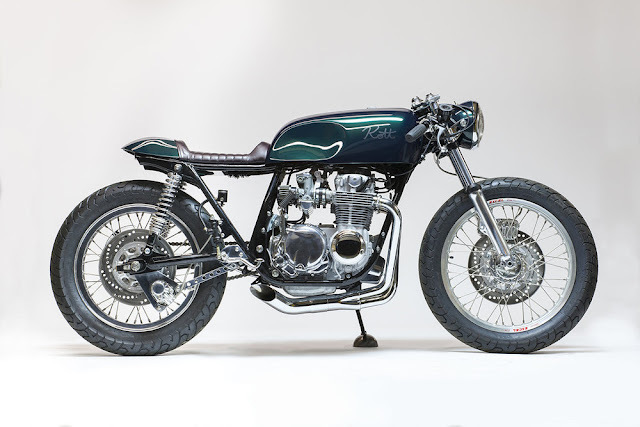 This particular 1975 Honda CB 550, which I'm simply referring to as the '18, resembles what has become my favorite stance for any of the CB models which Kott Motorcycles is known for. 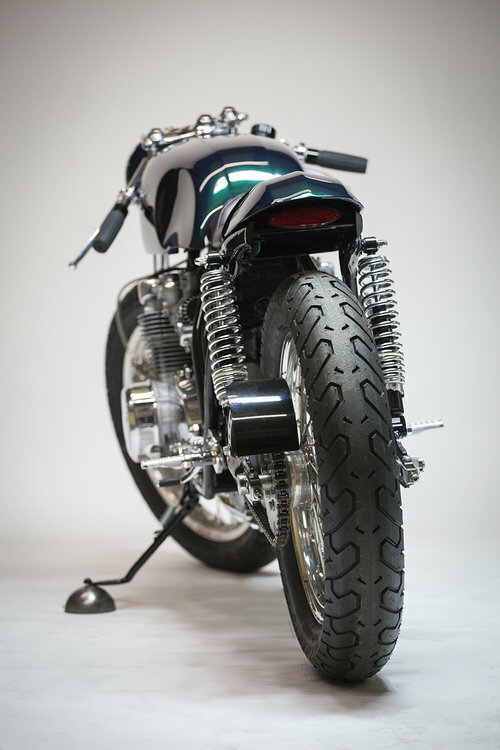 The most prominent feature is the CB 750 SuperSport fuel tank. 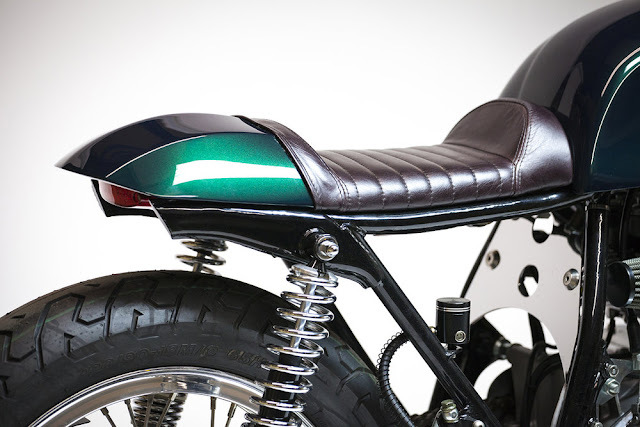 The reason for this choice of fuel tank is the overwhelming aesthetic fullness and presence it promotes for an otherwise unassuming and fairly docile (rider friendly) motorcycle. 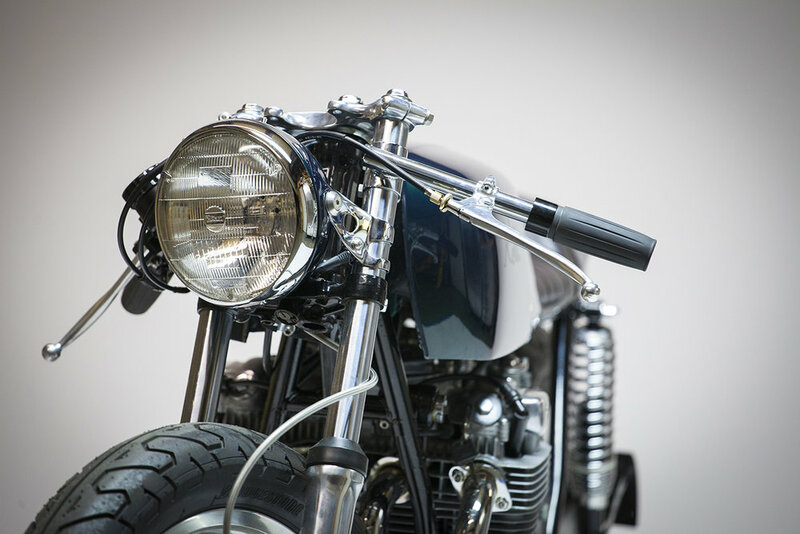 The nearly hyperbolic angularity of the tank against the upright motor and balanced wheel base, creates the opportunity for an equally aggressive, hand made, steel seat which optimizes overall machine proportions. In an attempt to almost compartmentalize and frame the motor, a four into one header and custom slash cut muffler were used to create a nuanced aesthetic of front heaviness to the bike. This front heaviness allowed for the rear half of the bike to remain clean and free of encumbrance while highlighting its own features. A number of rare, surviving, hand made parts from the 70's brought a special intrigue to the unauthored, rear disc brake assembly. 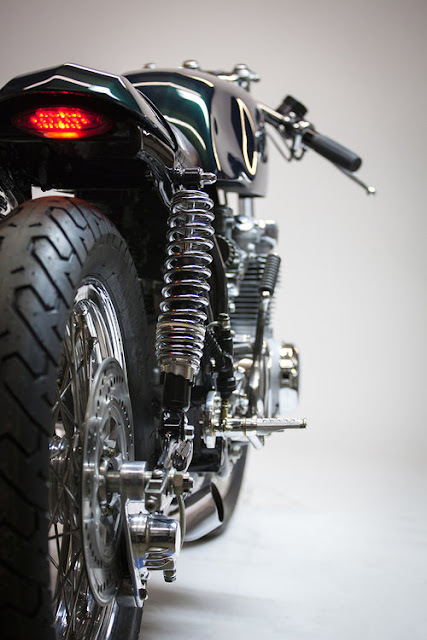 These parts were refined along with proprietary hand made rear sets in order to pay homage to the original and thoughtful designs which are too many to mention. 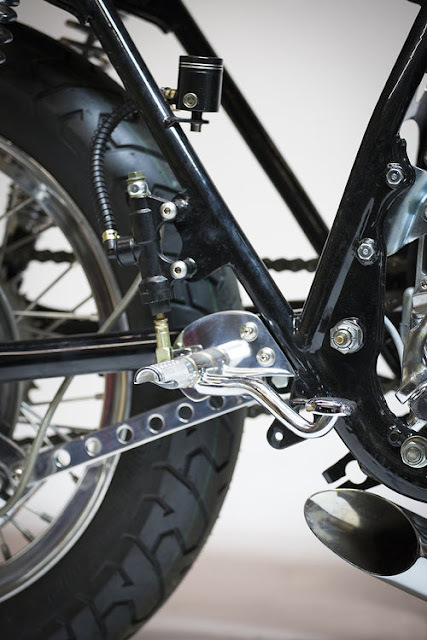 Additional intentionality toward proportion was used to bury the headlight as close to the triple clamp as possible while finalizing the reach of the seat to just above the end of the rear axle line. 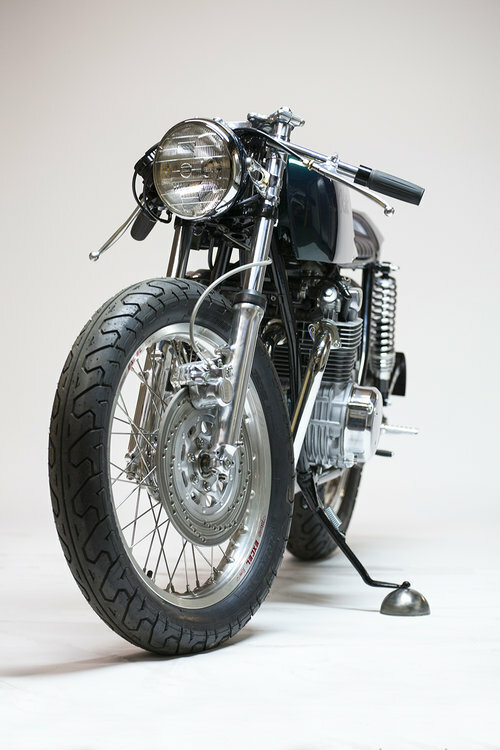 The customer which requested this bike brought in a simple picture of an older BMW, painted with an obvious custom shade of green. This photo was used as the cornerstone to create a simple, understated and timeless color scheme including an olive brown leather upholstery and reserved chrome plating. The most difficult part of the build was certainly trying to facilitate and restore the hand made parts that made up the unique components of the custom rear disc brake assembly. 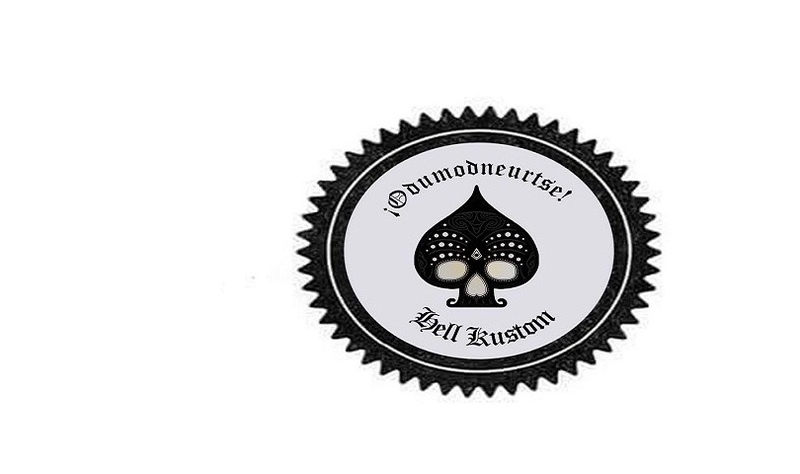 Immersing yourself into the mind behind proprietary design, when not one of your own, can be challenging and rewarding especially when you believe you've done justice by leaving it as good or better than you found it. The most rewarding aspect of the build is the implementation of another thoughtful and truly unique addition to the portfolio of Kott builds, which I hope will stand the test of time."